How possible is it for a contract with a publisher to state that when/if my book goes out of print rights revert to me? I'm okay with it happening years after the book has been out of print, but if a publisher isn't willing to or can't keep up a backlist with all the print-on-demand and ebook technologies out there why can't I do it myself? Publishing contracts have a standard "reversion of rights" clause that spells out when the rights come back to you. If by some horrid chance you signed a contract that does NOT have a rights reversion clause, well, next time you know to ask Miss Snark before you sign a contract you don't understand, and you can amend the contract. Rights reversions happen all the time. You don't have to wait years. If the publisher isn't exploiting the rights, chances are you can get them back just by asking. My contract says after a specified time in limbo (months, not years) I have to tell them either put it back in print or the rights are MINE, MINE, MINE. There is no auto-reversion. I do have to tell them. Then they can stand around the water cooler and say: "Who WAS that masked man, anyway?" Hi! 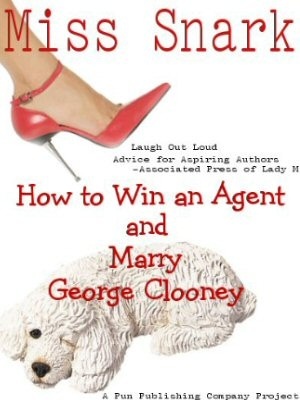 I'm Miss Snark and I'm an Agent! Looking for an SFF agent? How full is a full? Word of the day: DRAGOON!! Killer Yapp says "I told ya so"